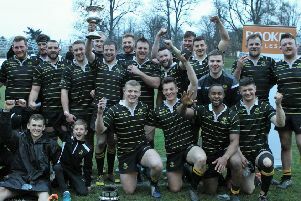 Selkirk have lined up a couple of February friendlies to compensate for their absence in cup competitions and keep themselves in practice during the Six Nations break. A display laced with spirit on Saturday against Marr, which pushed the Troon side off the top of the Division One table, signalled a good note on which to enter the international lay-off. The game ended 17-17 – with manager Tom Ramage having forecast that Selkirk would take something from it – ensuring they held on to their desired top six slot. “We could have won but I have to think the score was a fair reflection on how the game went,” said Ramage. The boss rued the surrendering of Selkirk’s 14-7 lead after half time, the yellow-carding of Andrew ‘Jock’ Renwick and the “silly infringement” which enabled Marr stand-off Colin Sturgeon to hit a 40-metre penalty, handing the lead to the Fullarton Park side for the first time in the game. But long-range kicking was a feature of the afternoon and Selkirk’s Rory Banks was formidable from the tee, converting tries by Bruce Riddell and Aaron McColm – and finally posting the lengthy penalty goal which squared the scores. Ramage felt a win and a draw against Marr was not bad going this season and would prepare Selkirk well for league games against other top teams when they resume in March. Before then, Selkirk host Division Two leaders Biggar on February 8, then face Edinburgh Accies at Raeburn Place on February 16.